Normally, boiling an egg involves heating water in a saucepan, then dropping an egg inside to be properly heated. 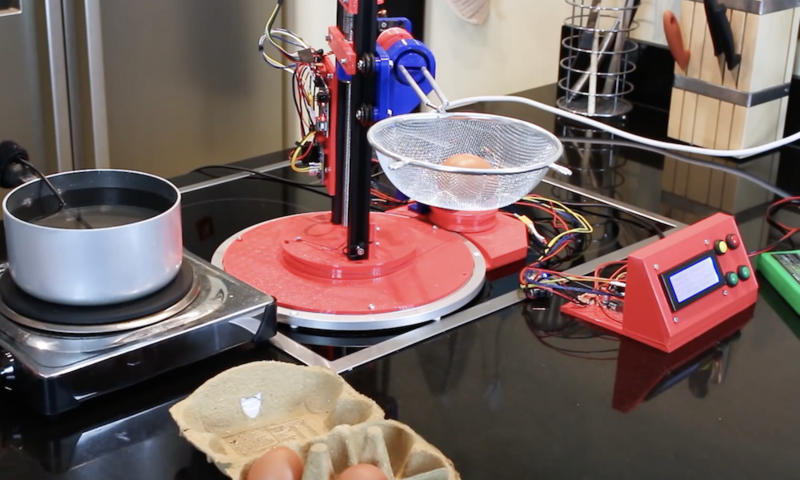 James Bruton, however, now has a bit of help in the form of his breakfast-making robot. The device uses two servos, along with a motor/encoder/screw assembly to rotate and lower the egg into place. It then takes it out after six minutes, and tips it out into a secondary container. As of now, temperature is manually controlled, but it’s tracked with a DS18B20 temperature sensor to initiate the egg lowering procedure. An Arduino Uno takes care of the lifting screw assembly, while an Arduino Mega handles everything else.